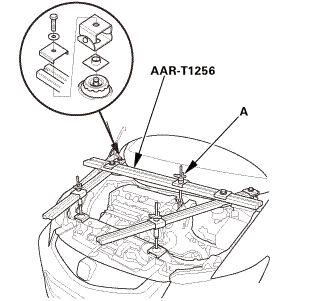 Remove the drain bolt (A), and drain the engine oil. 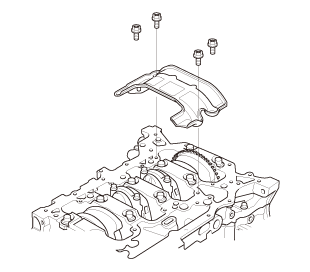 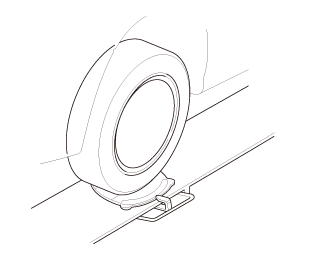 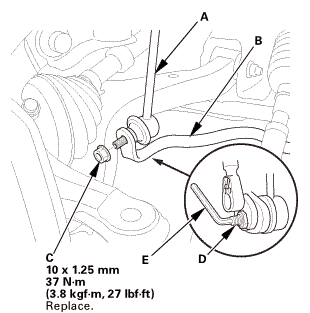 Reinstall the drain bolt with a new washer (B) and torque to specification. 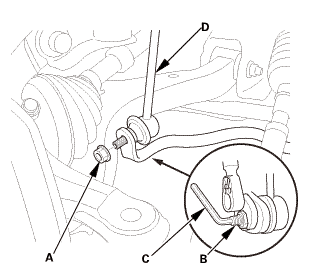 Remove the stabilizer link (D). 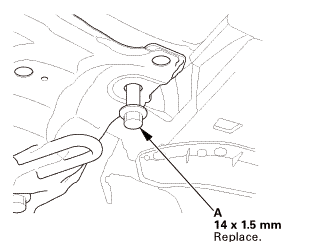 Loosen the mid stiffener mounting bolt (A) on both sides. 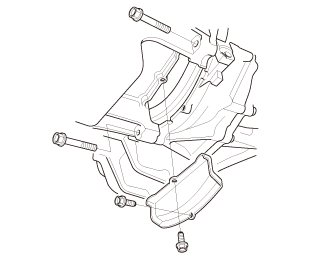 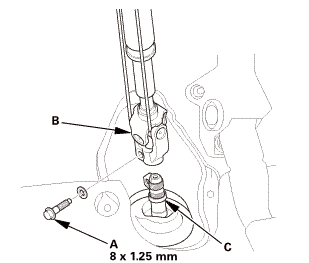 Loosen the front subframe mounting bolts (A) on both sides. 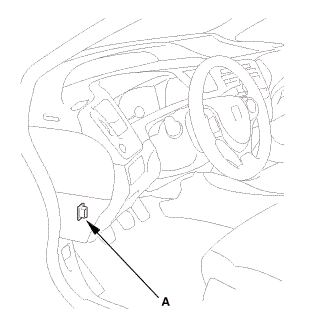 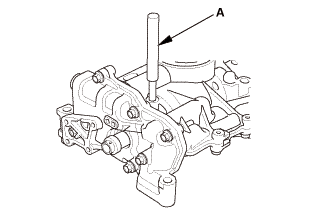 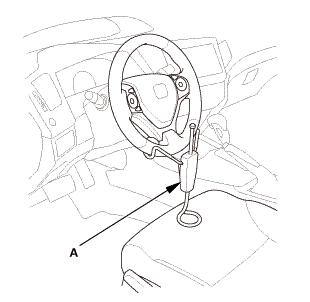 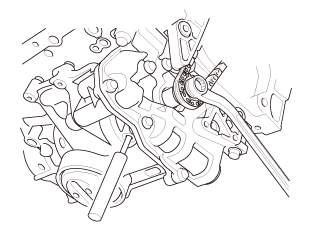 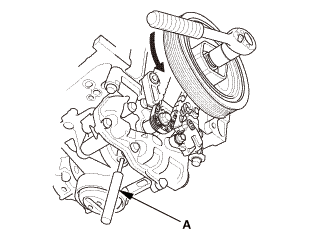 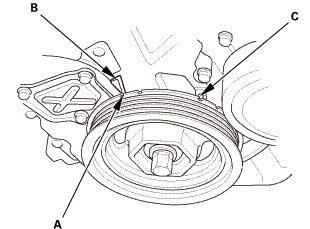 Turn the crankshaft pulley so its top dead center (TDC) mark (A) lines up with the pointer (B). 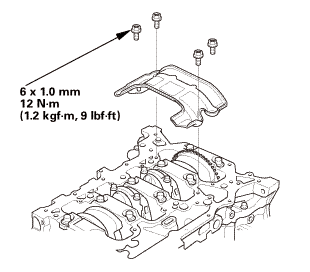 Remove the oil pump sprocket (A). 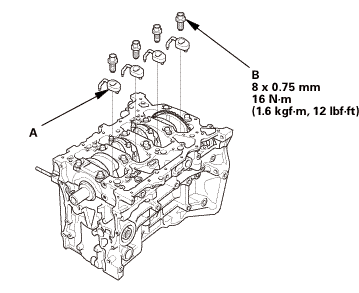 Remove the oil pump (B). 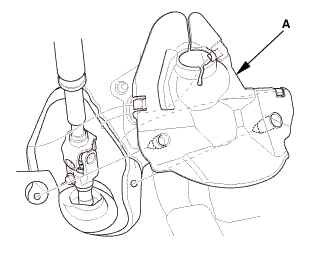 Remove the oil jet bolts (A) and the oil jets (B). 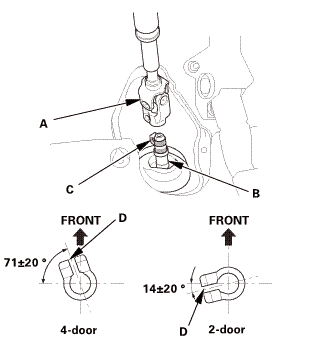 Inspect the oil jet and bolt as follows. 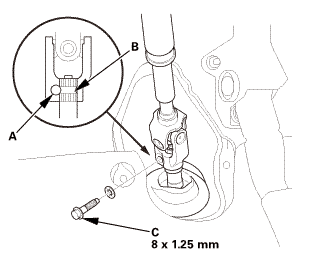 Make sure that a 1.2 mm (3/64 in) diameter drill bit will go through the nozzle hole (A) (1.31 mm (0.0516 in) diameter). 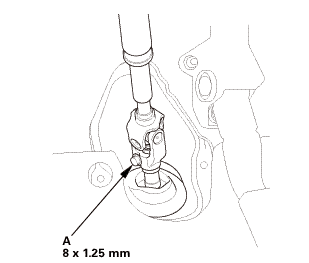 Insert the other end of a 1.9 mm (1/16 in) drill into the oil intake (2.0 mm (0.079 in) diameter). 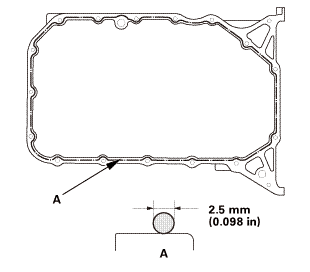 Make sure the check ball (B) moves smoothly and has a stroke of about 2.0 mm (0.079 in). 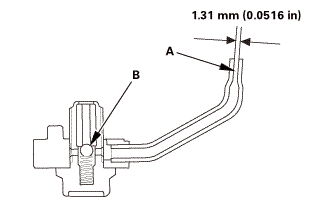 Check the oil jet operation with an air nozzle. 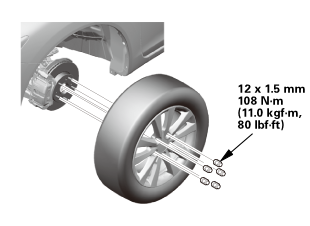 It should take at least 325 kPa (3.9 kgf/cm2, 47 psi) to unseat the check ball. 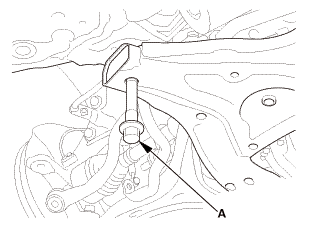 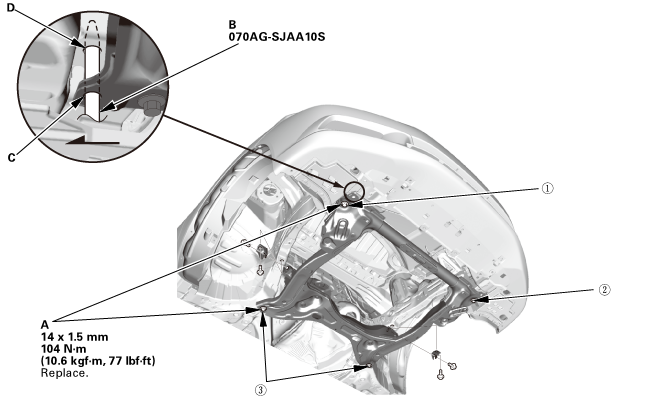 Carefully install the oil jets (A) and the oil jet bolts (B). 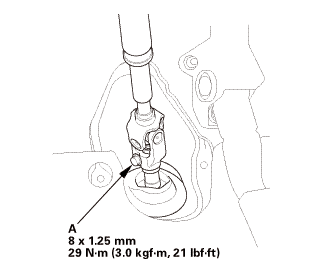 Align the dowel pin (A) on the rear balancer shaft with the mark (B) on the oil pump. 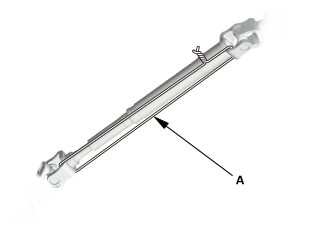 To hold the rear balancer shaft, insert a 6 mm long pin punch (A) (Snap-on PPC108LA or equivalent) into the maintenance hole in the balancer shaft holder and through the rear balancer shaft. 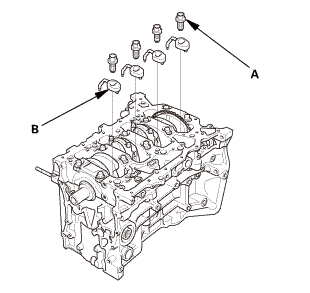 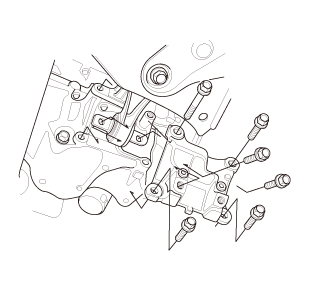 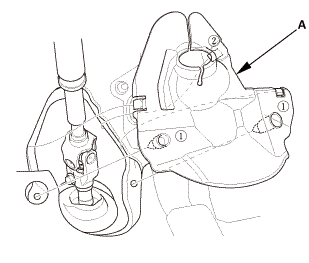 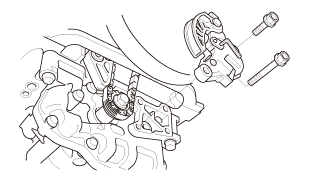 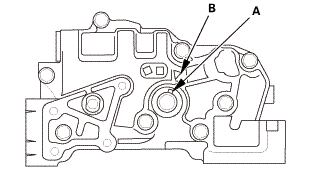 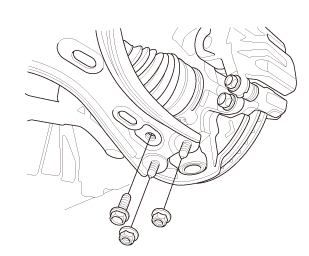 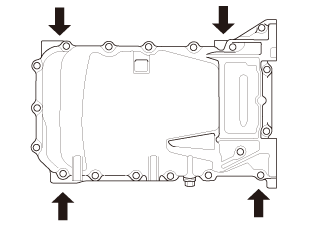 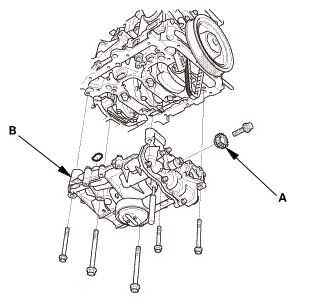 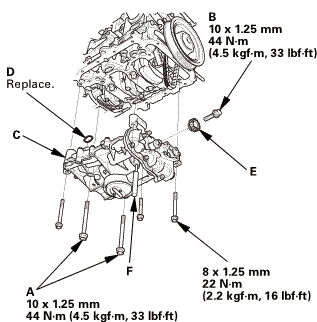 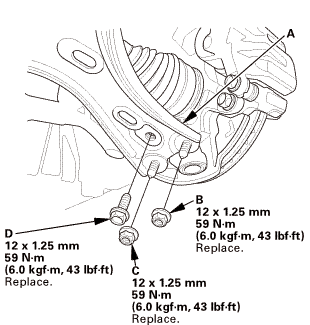 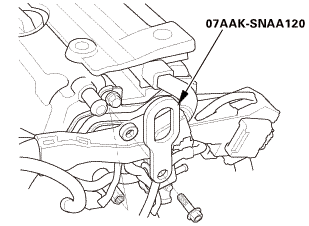 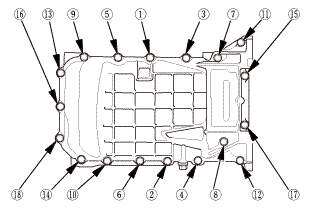 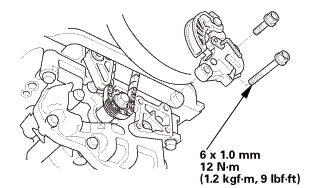 Apply new engine oil to the threads of the oil pump mounting bolts (A) and the oil pump sprocket mounting bolt (B). 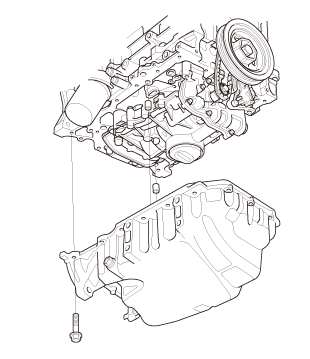 Loosely install the oil pump (C) with a new O-ring (D). 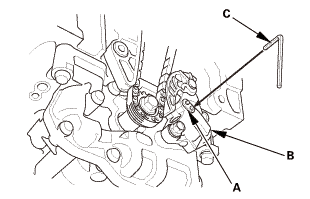 Install the oil pump sprocket (E). 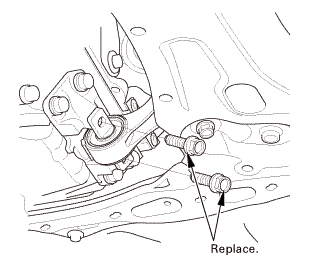 Tighten the oil pump mounting bolts and the oil pump sprocket mounting bolt. 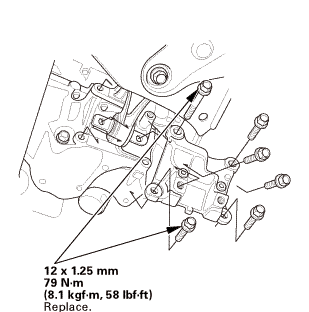 Remove the 6 mm long pin punch (F). 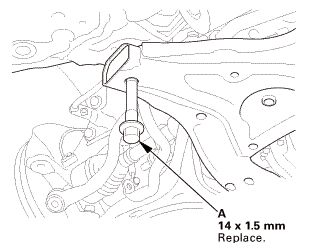 Install the lower torque rod bracket using new bolts. 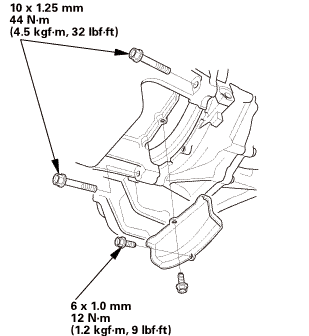 Loosely install the new front subframe mounting bolts (A) on both sides. 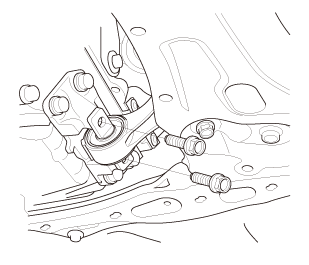 Loosely install the new lower torque rod mounting bolts. 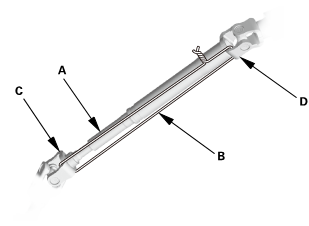 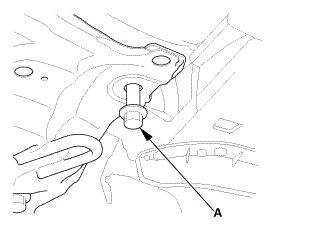 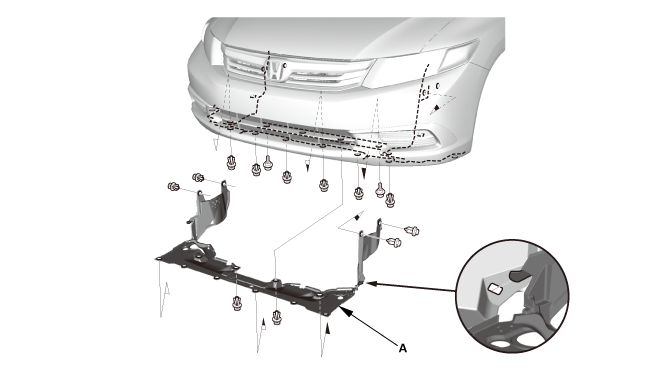 Install the stabilizer link (A) on the stabilizer bar (B) with the joint pins set at the center of their range of movement on both sides. 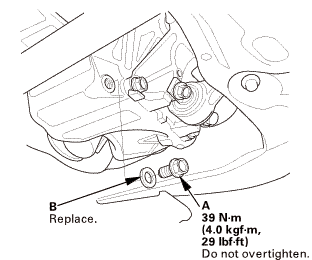 Install the new self-locking nut (C) on both sides. 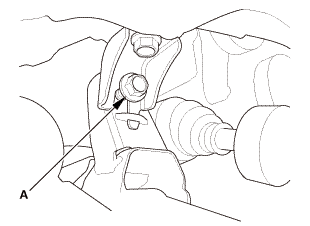 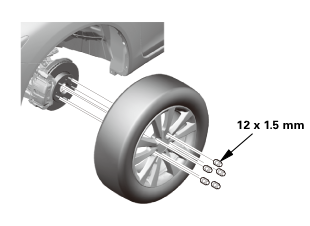 Tighten it to the specified torque while holding the respective joint pin (D) with a hex wrench (E) on both sides. 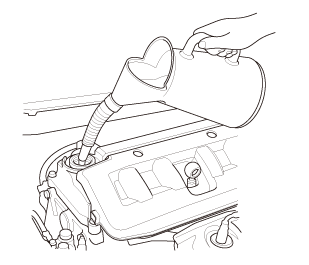 Refill the engine with the recommended engine oil.